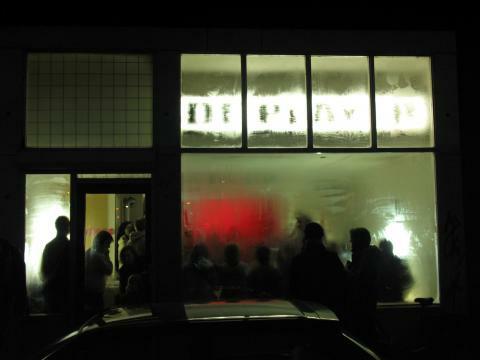 DE PLAYER is a polymorhpic production platform in Rotterdam, which has been putting together programs on the cutting edge of performance art, experimental music and the visual arts. We want to emphasise the importance of sound, and the performance and positioning of sound within the visual arts and contemporary experimental music. Theory, design, lifestyle and staging form a key role in this. We don’t adhere to the usual separation which occurs between the disciplines of music and visual art, rather we show their mutual inspirations and influences. DE PLAYER presents what we see as peripheral acts not inhibited by style. These are acts which in general, on their own strength, have managed to justify their existence. As far as the musical and visual choices are concerned, they have clear theoretical motivation and conceptual intentions. Often several media are put into play, and (self)reflection rather than industrial or economic motivation is the driving force. They exhibit a strong tendency toward independent attitudes in which the risk of failure is not deliberately evaded. The results which their processes produce, display a certain tenacity. In today’s world where standardisation has such predominance, we consider it important to call attention to these people and to give them a platform. Since the advent of the club, our program has been presented to the public in a happening-style setting: the physical, the performative, the impermanent, the audience, the hybridity of the program, the spectacle and the confusion – all of these are important elements in the function of our platform. The situation could be seen as comparable to the Dadaist salons – lots of activity and tumult, drinking and socialising, whilst all along there’s a innovative, substantive program on offer. The ambiance is not that of a concert hall (black box) nor that of the gallery (white cube) but what we could term a ‘grey dome’; a twilight zone.